March being special month with couple of birthdays in my house leaves me the challenge to bake eggless cakes for my darlings during this great lent period. Deciding what to bake for Noah was my dilemma. 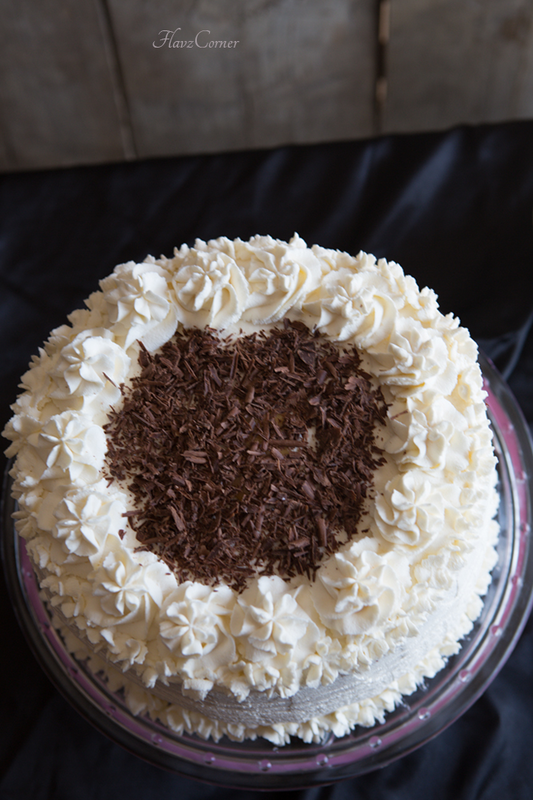 He loves chocolate flavor and whipped cream combo, so an ice cream cake was my initial plan. I had to drop that idea since I realized the minimal space left in my freezer was not going to help me at all. So I decided to go with something just simple as chocolate and whipped cream, but wanted to give a rich dense texture with some homemade caramel filling. I had all the cake ingredients ready couple of days before the party. I had a crowd of 25 to entertain on the party. After burning first batch of caramel by experimenting with another recipe and smoking part of the kitchen, I decided to try half the recipe with some milk. 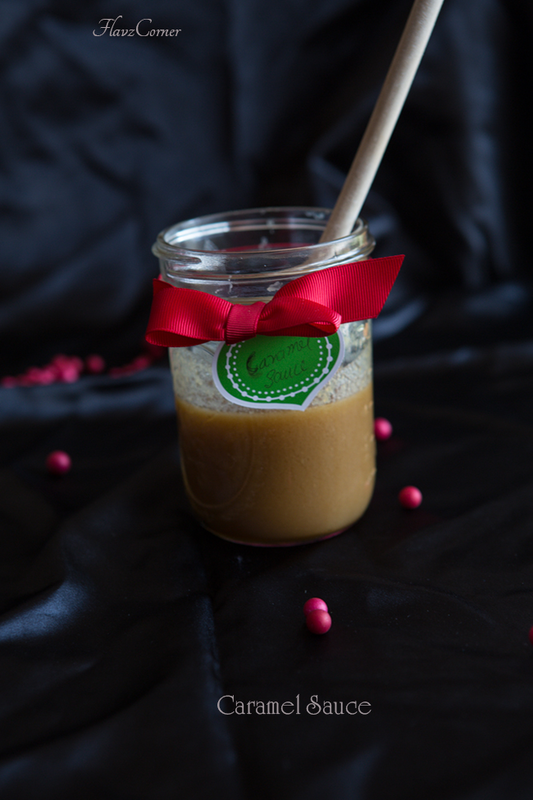 It resulted in curdled & runny liquid that cannot be even categorized under anything related to Caramel. My third attempt with another recipe with 1/4 cup of sugar resulted in what I was looking for. As soon as I finished my test batch, I heard the running footsteps from up stairs. Both Nathan & Nicole came rushing to find out the source of the pleasant smell that they were not able to identify even though they were sent to bed. It was late night for them, but Nicole wanted to enjoy the warm Caramel with some apples even though she brushed. She promised me that she will brush again. The fresh cut apple with warm caramel was divine. Due to the time limitation, I was not able to style or take good pictures. It's always a struggle to put together the cake on the day of the party for me. I also added the layer of complication to this birthday cake by layering two 9' cakes which was taller and needed refrigeration due to whipped cream frosting. The real challenge was when I realized that my cake caddy's lid was shorter than the height of the cake. I had to cover the cake and refrigerate to avoid crusting till the party begins. There was no box in my house that would fit in the refrigerator, even though I had tons of cardboard boxes lying down in the basement. I finally decided to use my cake caddy's lid with a simple trick. I inserted 5 long wooden skewers into the center of the cake and had the caddy lid sit on these skewers. This left the bottom part of the cake open, which was covered by plastic wrap. After removing a rack from the refrigerator, I was able to fit this tall cake in the refrigerator all covered. Kids were impressed by Mommy's idea and they were so happy to see the decorated cake. After giving the kids the strict order to not open the refrigerator till the cake was ready for cutting, I went with the remaining chores of cleaning the kitchen counter and making snacks. My heart was pounding fast each time when hubby opened and closed the refrigerator as I was not sure how long the skewers were able to hold the Caddy lid. But it all worked well. A little bit was left over for the next day and it tasted better than the first day and kids were competing for bigger pieces :). The cake was perfect with the right balance of sweetness contributed by slightly sweetened whipped cream and creamy caramel. Pre- heat oven to 350 °F. Sift together flour, cocoa powder, salt, baking soda and cinnamon powder and keep it aside. In a mixing bowl of a stand mixture, beat together sugar, oil, cold coffee, white vinegar and vanilla extract till everything is mixed well. Now add the dry ingredients and mix for 30 seconds till the dry ingredients are well incorporated into the wet ingredients. Grease a 9' round pan with butter/cooking spray or line the pan with wax/parchment paper. Pour the batter into the prepared pan and bake for 40 - 50 minutes or till a tooth pick comes out clean when tested in the center of the cake. I used a dark metallic pan, so my cooking time was 55 minutes. Let the cake cool. Since this is a layered cake, I made another 9' cake with the same above recipe. So you have to basically double the above recipe to make two 9' cakes. Meanwhile the cakes are cooling, you can make the caramel sauce by placing all the ingredients for the caramel sauce except vanilla extract in a heavy bottom sauce pan and bring to boil. Cook it for 5 - 7 minutes on medium heat by stirring in between using a wooden spoon. As it starts to thicken, turn off the burner and add the vanilla and mix well. Keep it aside to cool. As it cools, it will thicken and attain the consistency of caramel sauce. In a cold mixing bowl of a stand mixer, combine 1 cup of whipping cream with 4 tbsp of powdered sugar and 1/2 tsp of vanilla. Using a whip attachment whip it till soft peaks are developed. Transfer these to a cold bowl for filling the cake and crumb coating. Clean the mixing bowl with ice water and dry. Now whip together 2 1/2 cup whipping cream, 10 tbsp of powdered sugar and 1 1/2 tsp vanilla extract till stiff peaks are formed for about 1-2 minutes. Cut off the bulged top of the cakes. Apply1 tbsp of the cold caramel on the cake board/cake stand. Place the first cake on the stand and brush the caramel sauce on top of the cake. Drizzle 1 to 2 tbsp of caramel on the cake and poke few holes into the cake using a skewer, so that the drizzled caramel will be soaking into the cake. Now apply a dollop of whipped cream made for layering evenly on the top of the cake. Place the second layer of cake and repeat the process of caramel application and drizzling. Crumb coat the layered cake with left over whipped cream prepared for layering. Use the second batch of whipped cream for frosting the cake. I used a 2D Wilton tip to make the design on the cake after leveling the cake with Angled Spatula. The design on the side was done using Wilton Decorating Triangle. The top part of the cake was decorated with some shaved chocolate. You can just make one 9' cake and divide it into half to make a layered cake instead of two 9' cakes if you don't want your cake to be taller. 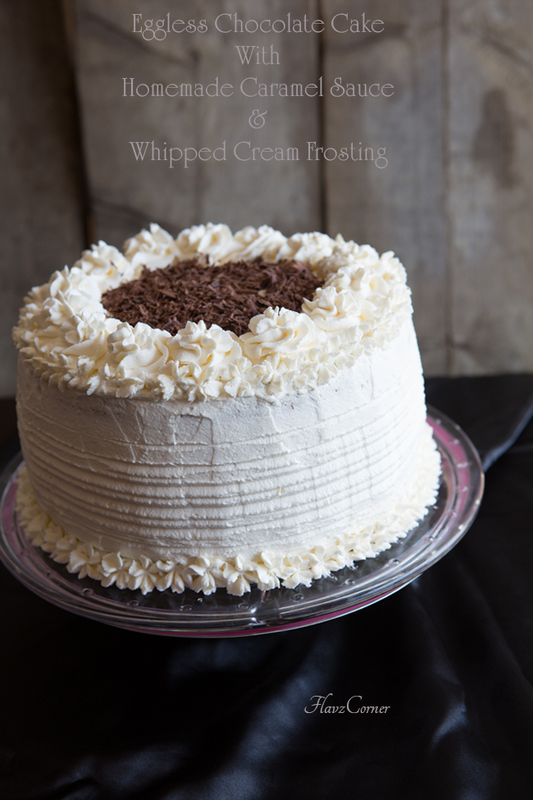 If you are just using one 9' cake, adjust the recipe for whipped frosting to half. Don't over beat the frosting. It took me between 1-2 minutes to get a stiff consistency for the frosting. Over beating the whipping cream will result in curdled frosting which will not be good for piping. You can use Meringue powder or gelatin to stabilize the whipping cream if you are not keen about vegetarian cake. Refrigerate the cake covered till ready to use. There will be some left over caramel from the above recipe that you can enjoy with ice creams or dessert of your choice or even with apples. You can use a electric hand mixer or even use a wired whisk to whip the cream for frosting. Make sure the whisk and bowl are very cold. You don't need fancy equipments and tools to decorate this cake. You can use a regular flat spatula to level the frosting and use a fork to make design on the sides. Instead of making flowers with frosting, pour melted cold chocolate and caramel over the cake. Top with some chocolate shavings. I used a vegetable peeler to shave the chocolate. This is one elegant layered cake, Shibi. The cake looks so moist even though it's eggless. Excellent! Your cake looks amazing- so moist and fluffy! Moist, soft and elegant cake. Happy Birthday to Noah. What rich and fabulous cake that is..:-) The last pic is so alluring! wow Shibi,such gorgoeuis cake ! cant help but wpnder how in the world you got such thick frosting with just whip cream. whatever i do..it ends up soo watery. never this consistency. any tips, darling ?? Weather or the surrounding temp is crucial in making whipped cream frosting. Like I mentioned in the post, use a very cold mixing bowl and whisk. Leave the whisk and bowl in the freezer for 10-20 minutes before you use them. Also the whipping cream should only be taken when you are ready to whip. I use a stand mixture which takes less time to get the right consistency. If you are using a electric hand mixture, immerse the bottom of the mixing bowl in ice water while whipping. You can also use Wilton's Meringue powder to stabilize the whipping cream. Also don't overmix the cream, that will end up in curdled butter. Hope this will help. thanks a bunch swetheart for the tips. yes me too do these ways using a stand alone mixer...but somehow...some where..kuch teek nahi hai ;) . I am now sorting to instant jello pudding mix to the whip cream to stabilize it. Finally, that works :). Wow! A gorgeous Cake ! The pics are very tempting. Shibi - beautiful cake and love how you have decorated it...looks really moist soft and delicious.. great idea/ tip for storing a tall cake like this. Storing cake like these is always a challenge as they occupy so much space... I bet all kids might have enjoyed this and happy birthday to Noah! What a gorgeous cake, I love it. It takes so much patience to create something like this. I think the photographs are just amazing, even though you say you did not have time to shoot and style it. Belated birthday wishes to Noah ! Thank you everyone for the lovely inspiring comments!! The cake looks beautiful and the pic with the sliced cake, the dark against the white, looks amazing. I think you have done everything to perfection...till the T! Great post Shibi. Wow - the texture on this cake is phenomenal - I would never have thought it was eggless! Gorgeous whipped cream frosting too! What a great looking cake! If you hadn't said it was eggless, I wouldn't have known. Great decorating job -- this looks terrific. And I'll bet it tasted amazing. Thanks. Absolutely stunning cake….I just don’t have enough words. This cake is stunning!!! Can't believe it's eggless! And the caramel and whipped topping.. oh man I want to faceplant through my screen into your photos immediately!!! Can brewed coffee replaced with something else ? You can use regular coffee/instant coffee. If you want to skip coffee, you can use 2 cups of water instead. I have tried the recipe for cup cakes without coffee and it comes out good too. 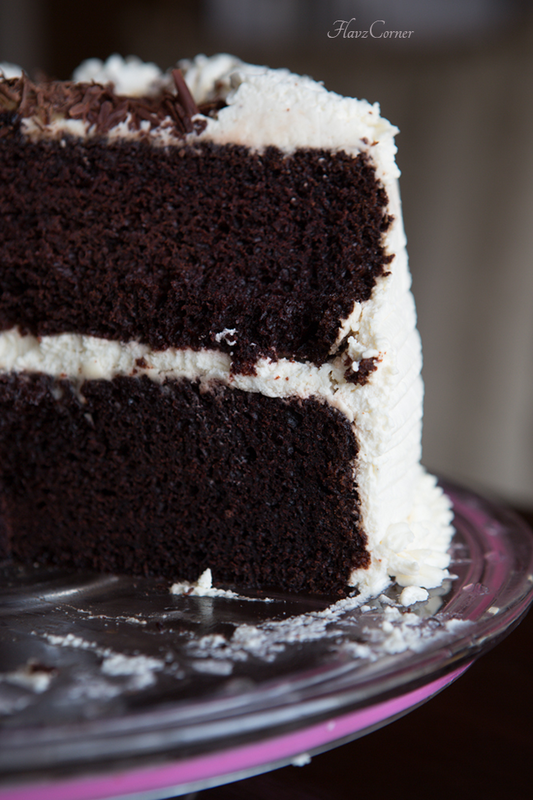 Coffee gives a nice flavor to the cake, but you can very well skip it and use water as the wet ingredient. The taste may vary a bit, but its good too. Hope I answered your question.